A little flash… a little .. aggravation? Some materials will have the tendency to drive us a little crazy. Materials that don’t want to cooperate when we attempt to tie them in, and in some cases, the pinch wrap just wont cut it. Flash material, rubber legs and even laser dubbing that are some of those culprits that are frequently giving us a problem. One minute you’re trying to tie in a few small strands and next thing you know the flash is kinked, the legs are snapped or pulling out and you’ve accomplished nothing but a mess; so I am going to show you a quick trick that will help you get a handle on them. The way this technique works is that where-ever your thread has stopped, is where your material is going to land when you slide it up; so be sure that you are beginning this technique where you would like it to be tied in place. One other point I wanted to make is that you will be doubling over your material, so if you are looking for your fly to have two rubber legs in that area; you will only need one piece of material. Then loop it around and hold it tight with your fingers. Once you have decided on placement, take your material and loop it around the back of the hanging bobbin. Bring it back around front and grasp it with your fingers. This will create a loop around the thread in which you can now manipulate. Holding the bobbin still in one hand, pull back on the looped material and slide it up into place. Once in place, simply hold tight and bring your thread over the hook to lock it in place. 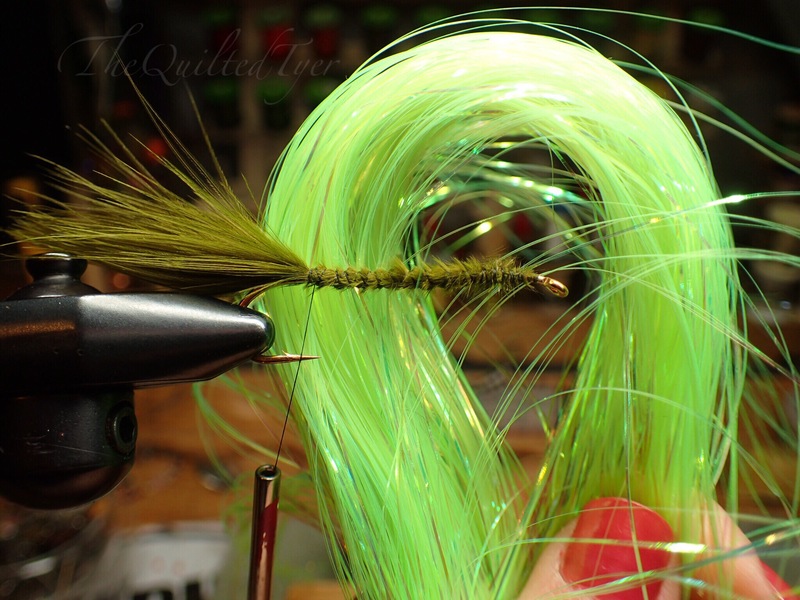 If you are using flash like in the Low Water Wooly Bugger you can pull it back and take a few wraps to secure it in place and continue with your pattern. Remember this technique can be used for other materials, including laser dubbing on the Bass Agitator; so feel free to use it anywhere that it can help you.